Fletcher Henderson (1898–1952) was one of the most influential pianists, band leaders, and arrangers in the history of jazz. He was the most commercially successful African-American musician during the 1920s, especially as a leader of his own orchestra in both recording and live performances. His arrangements provided the basis for what was to become known as “swing” music in regard to instrumentation, form, and compositional principles between soloists, sections, and the overall ensemble. Active primarily in New York when not touring, his band featured such notable musicians as Louis Armstrong, Coleman Hawkins, Don Redman, and Fletcher’s brother, Horace. 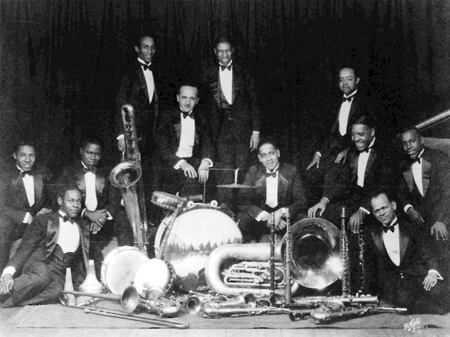 In 1939, Henderson ceased operation of his own band and joined Benny Goodman’s big band as pianist and chief arranger. This was the first time a black musician was hired to perform with a white band. 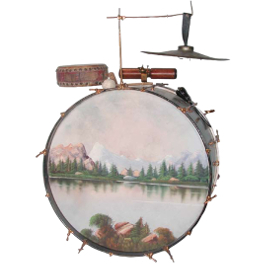 This Bass DrumThe lowest pitched drum in a marching band or with a drum set. A two-headed drum, it is usually... Kit was purchased from Fletcher’s brother, Horace Henderson, who played piano as well as arranged for Fletcher’s band. 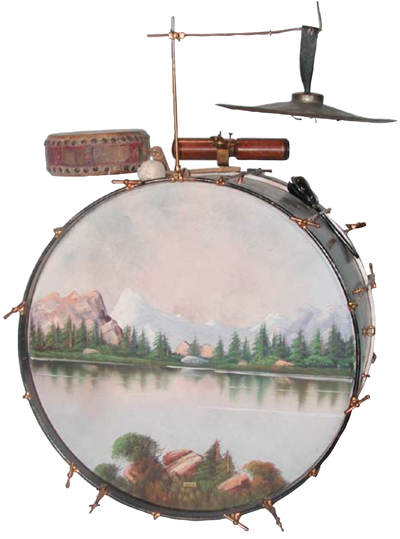 It includes a 14 x 28 1920s-era Ludwig & Ludwig bass drumA hollow cylindrical shell of any size that has a head stretched over one or both ends and is b... with interior lighting and a mountain-with-lake scene painted on the front calfskin head. It features a 14-inch Chinese cymbalA copper/bronze (or variation of metal alloy) disk struck with a drumstick or crashed together ..., a 1924 Ludwig & Ludwig bass drum pedalThe pedal used to play the bass drum on a drum set. with cymbal striker attachment, and several accessories, including castanetsA pair of hard, spoon-shaped shells, either held in the hand or mounted on hand paddles, that a..., woodblocks, a snare drumOne of the more common drums in marching bands and drumlines and the primary drum of a drum set... stand, and miscellaneous sticks, brushesA type of mallet that consists of fanned-out wire bristles and are typically used in jazz drumm..., and mallets. It was played by Kaiser Marshall, who was Henderson’s drummer during the early 1920s, and possibly by later drummers in Henderson’s band. The Chinese tom-tomA single cylindrical drum, with either one or two drum heads. Tom toms are mounted on a drum se... in the photograph is not original to the set, but is matched to it for display purposes. This tom (1996-01-05) was donated by Terry Clarke.